The evidence for evolution - What evidence does the fossil record provide? The fit between the fossil record and evolutionary inferences is good evidence for evolution, because if fish, amphibians, reptiles, and mammals had been separately created, we should not expect them to appear in the fossil record in the exact order of their apparent evolution. "I will give up my belief in evolution if someone finds a fossil rabbit in the Precambrian." The reason is that the rabbit, which is a fully formed mammal, must have evolved through reptilian, amphibian, and piscine stages and should not therefore appear in the fossil record a hundred million years or so before its fossil ancestors. Opponents of evolution have appreciated the power of this argument and numerous fraudulent claims have been made for fossil human footprints contemporary with dinosaur tracks. The fact that no such human fossils have been found - that the order of appearance of the main fossil groups matches their evolutionary order - is the way in which the fossil record does provide good evidence for evolution. Figure: analysis of modern forms indicates that amphibians and reptiles are evolutionary intermediate between fish and mammals. 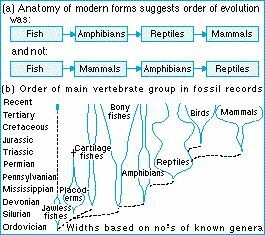 This order fits with the geological succession of the major vertebrate groups. The width of each group indicates the diversity of the group at the time. From Simpson (1949).